"I have conducted surgeries on nearly 40 such cattle from Annavaram devasthanam. Two cows died due to plastic poisoning," he said. RAJAHMUNDRY: In an incident that highlights the severity of plastic pollution, veterinary doctors on Saturday removed plastic bags and other harmful material weighing abut 30 kgs from the belly of a cow at Jatlapalem village of Tadepalligudem in West Godavari district. The team also removed iron rust, flexi banners, bolts, screws and nails after a tedious surgical intervention. The cow attached to a gosala has been sick and a close examination revealed the presence of foreign objects inside its stomach. Doctors decided to remove the waste through a surgical procedure. The animal was rescued recently while it was being transported from north coastal Andhra to Hyderabad on the national highway 16. The eight-year-old cow was operated upon. 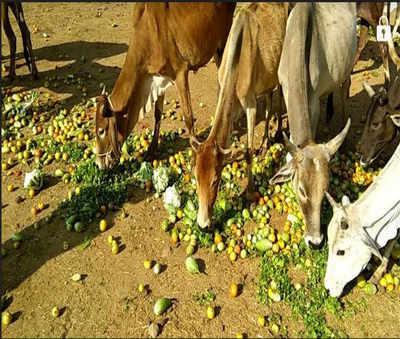 A deep cut was made into its belly, said Dr K Sivaji, West Godavari district joint director of animal husbandry department. Dr Sivaji told TOI that the animal became sick after eating the waste, mostly plastic. The growth of the animal was also affected. The waste entered the animal while it was grazing near roads. "I have conducted surgeries on nearly 40 such cattle from Annavaram devasthanam. Two cows died due to plastic poisoning," he said.